"Uncovering and Publishing the History of Pennsylvania’s Carpatho-Rusyns"
"Through the collection and research of chain migration data, parish histories, church and civil records, immigrant newspapers, photographs, oral histories, and memoirs, the author is writing a history, in words and in pictures, of the Carpatho-Rusyn immigrant communities of the state of Pennsylvania. He has amassed a collection of source material that he is assembling into the most comprehensive look at the history of Carpatho-Rusyn communities anywhere in the world. He will speak about this project and also about the unique situation of Rusyns in northwestern PA, where farming became the primary occupation of Rusyns. Mr. Custer was a founder of the Carpatho-Rusyn Society in 1994, and Editor of its New Rusyn Times newsletter until 2016. He is the author of scholarly and popular articles of Rusyn history and the blog “The Carpatho-Rusyns of Pennsylvania” (rusynsofpa.blogspot.com). He co-authored the book Príkra (Prešov, Slovakia, 2006), a history of his Rusyn maternal grandmother’s village in eastern Slovakia. He holds master’s degrees in Business and Eastern Europe studies from the University of Pittsburgh. Our Chapter is truly honored that Mr. Custer will come and speak at our Chapter and we wish for every member to attend and bring a friend." A lecture by Richard Custer titled ‘Uncovering and Publishing the History of Pennsylvania’s Carpatho-Rusyns’ at St. Michael's Byzantine Church in Hermitage, Pa was attended by sixty people. 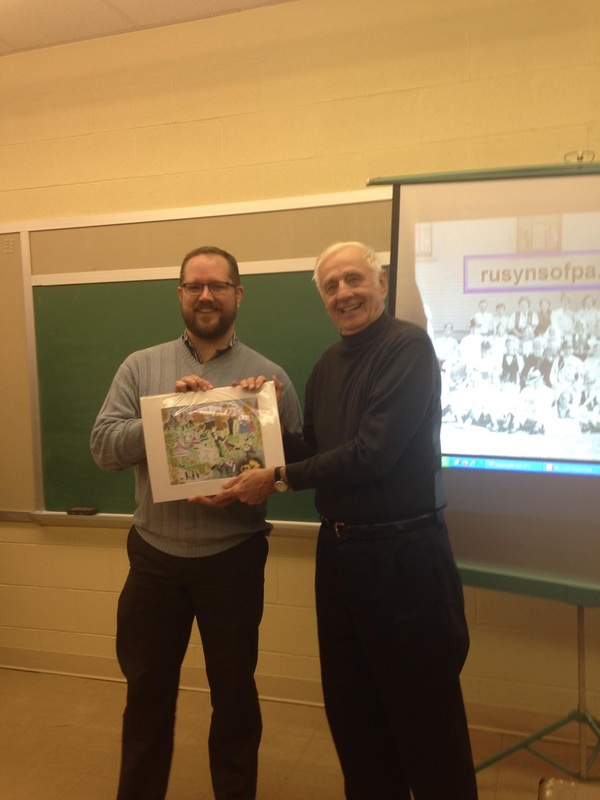 Jim Basista, president of the chapter, presented Rich Custer with a print of an original painting of the Vatras that our chapter commissioned.